Keep in mind that if you want the best and most elegant 3D rendering of a room or house plan, you need to get our Interiors program, and if you do you will get FREE, with our compliments, the FREE 3D Home and Office Library which has 1718 true 3D objects. However, if you’re not inclined to purchase Interiors at this time, you’ll find that the combination of MacDraft (OS X) and the 2D Home, Office, and Landscape Library together will be the next best thing. This is not to say that you necessarily need more than just MacDraft and our 2D library to create great floor plans—you don’t. But some people visualize living space best with either 3D or “two and a half D” because they use objects that show perspective. The 3 major folders in the 2D Home, Office, and Landscape Library are Samples, Templates, and Objects—this latter has 42 object libraries in it. In MacDraft, use Import Picture on the File menu to check out “sample 1.png” and “sample 1 top.png” too. Both are in Samples. Note that for each top view object in “sample 1 top.png” you can substitute a front, back, left or right view when creating a “2 and a half D” rendering of the top view’s plan. To create any “2 and a half D” view, simply use our templates to get started. In the Template folder, find “template2 for 2 and a half D.md60” which is a MacDraft file you open with Open in the File menu. For your convenience, we’ve put a sample of the way to use this template lower down on the page. It’s an image, which you may delete as soon as you get the idea. Use this template for creating any “2 and a half D” perspective view and save it as a MacDraft and/or image file. And check out “template for 2 and a half D.png” if you want the perspective lines as an image. Next, import the image “template sample.png”. 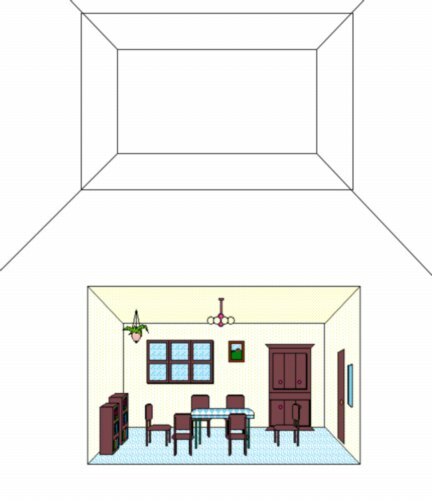 Notice that when we load objects nearer the front/bottom of the room, we must grab their corner handles and drag them to enlarge them to keep true perspective. Note the perspective rectangle between the shelf and the couch. 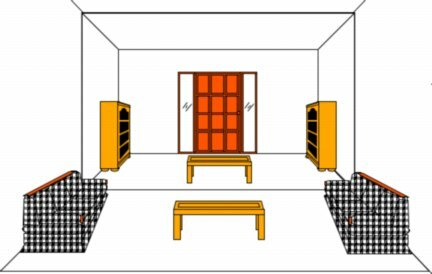 We consider a room that goes from the back wall to this central perspective rectangle to be a SMALL room and a room that uses both the front area with the couches and the back area with the shelves to be a BIG room. Finally, you may edit the ceiling height and back wall width of the “template2 for 2 and a half D.md60” template by dragging the template’s back wall rectangle in MacDraft—this is how you make the room taller/shorter or wider/narrower. Make sure to keep the diagonal perspective lines at the angle they’re at now when you edit them. In other words, make the perspective lines extending from the edited room corners parallel to the current ones after you edit the back wall and move these diagonal lines. Check out the rest of the sample pictures in the SAMPLES folder.